I wasn't sure when I got this what it would do when it flowered. It turns out that little yellow flowers open in a ring that goes from the bottom to the top. The brown section at the bottom are flowers that have already flowered and died. Isn't that fantastic? I love unusual flowers. I had originally wanted to get several bromeliads for my woods, but with the drought we had last year, I am keeping them close to home in the shade. This one needs to be divided, but in a location I can provide summer water. It's lovely nice to see a red stem too. 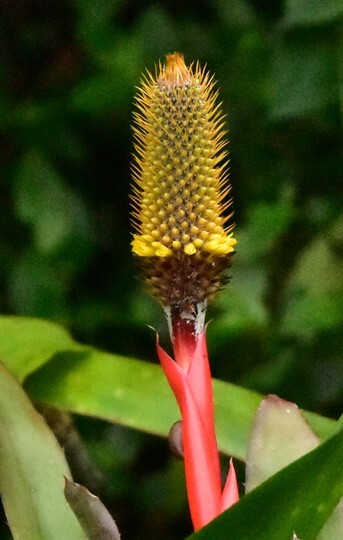 This photo is of species Aechmea pineliana var. minuta. See who else has plants in genus Aechmea.